In addition to chickpea liquid, I mixed chickpea / besan flour in with regular flour. It was completely undetectable thanks to there also being banana, cinnamon and vanilla in the batter. However, this meant the pancakes were higher in protein than usual, which was a bonus after a run. 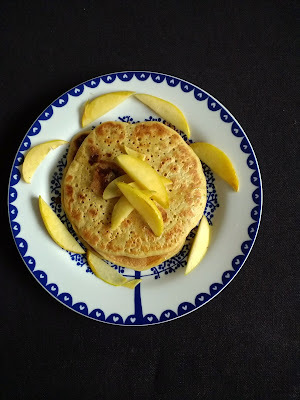 I served these with apple slices, sauteed in the pancake pan until slightly softened, and a drizzle of fruit-based syrup. Maple syrup would be delicious too, of course. I can't offer you a day off work, but I hope you enjoy these pancakes if you give them a try. Combine the dry ingredients (flours, baking powder, cinnamon) in a mixing bowl and whisk together. Add the aquafaba, vanilla, mashed banana and milk and stir to combine. Heat a non-stick pan over medium-high heat and spray with oil if required. Pour in batter to create a pancake of your desired size, and cook for several minutes until bubbles start to appear on the surface. Flip and cook for a further few minutes, and then repeat for the remaining batter. If using, heat the apple slices in your hot pan after you have finished cooking the pancakes. Serve with maple syrup. Do you have a favourite pancake recipe? The day was pretty amazing - I was definitely left feeling refreshed! Thanks Johanna. 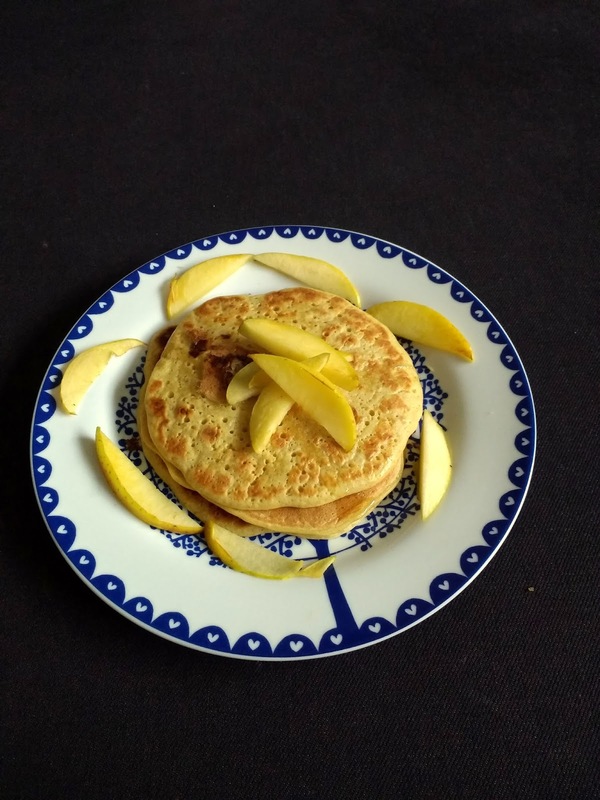 These vegan pancakes certainly do look fluffy and I believe you if you claim they are the best. I will have to try them out, I was wondering if the chickpea flour flavour was prominent, so thanks for your insight. Also a whole day to yourself - make the most of them when you have them. Thanks Shaheen - I know, such a luxury! 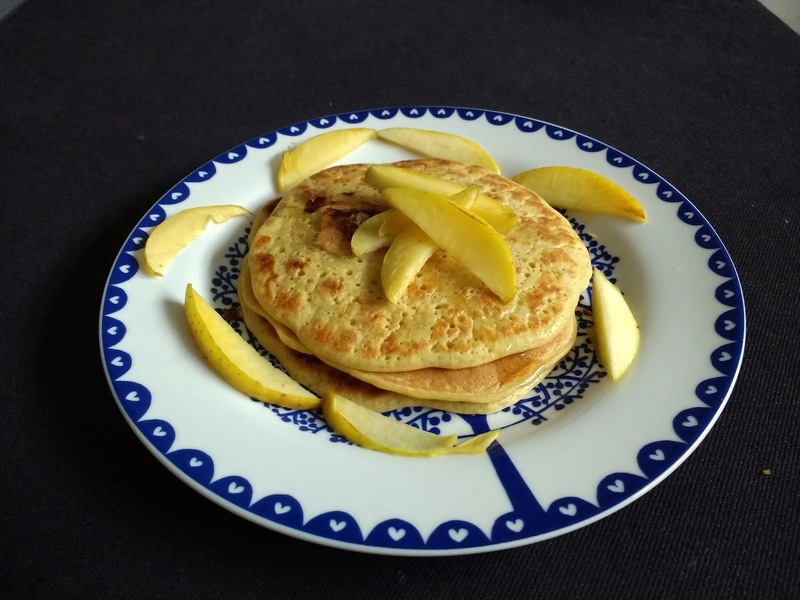 These pancakes sound so good - the perfect way to enjoy brekky on a half day off. It was actually a full day ;) Even better!! These look delicous! I love aquafaba but haven't tried them in pancakes yet, very excited to check them out!